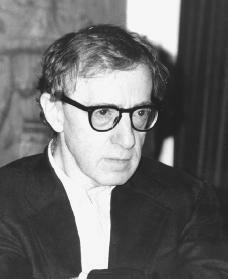 Woody Allen is one of America's most prominent filmmakers. He has made many comedies and serious films that deal with subjects that have always interested him—the relationships of men and women, death, and the meaning of life. Woody Allen was born Allen Stewart Konigsberg on December 1, 1935, in the Flatbush area of Brooklyn, New York, into a family that he described as "typical noisy ethnic." His father, Martin, held a variety of jobs including bartending, and his mother, Nettie, worked as a bookkeeper. His only sibling is a sister. As a teenager Woody did not show much intellectual or social interest and spent long hours in his bedroom practicing magic tricks. He started using the name Woody Allen at age seventeen when he began submitting jokes to a local newspaper. People noticed his jokes and asked him to write for other comedians. After Allen graduated from high school, he enrolled in New York University as a motion picture major and, later, in the night school at City College, but he was unhappy. He dropped out of both schools to pursue his career as a comedy writer. Before Allen turned twenty he had sold twenty thousand gags (short jokes) to the New York newspapers. By the time he turned twenty-three he was writing for one of television's biggest comedy stars, Sid Caesar (1922–). He also hired a tutor from Columbia University to teach him literature and philosophy (the study of knowledge). Allen began performing his own material in a small New York City nightclub in 1960. He worked six nights a week and learned how to work with an audience. He began to be noticed and started to appear on network television. Unlike other comics who favored political humor, Allen made jokes about his own comic character whom he had invented, a little guy tormented by the big questions about life issues and his hard luck with women. Success in clubs and on television led to a comedy album that was nominated for a Grammy (a recording industry award) in 1964. Allen had long been a lover of movies, American and foreign, but the first one he wrote and acted in, What's New, Pussycat? (1965), turned out to be a very bad experience for him. He was so unhappy that he said he would never do another movie unless he was given complete control of the cast and how it looked in the end. Fortunately, What's New, Pussycat? was so successful that Allen was given his wish for future movies. Allen was successful in writing and directing films such as Take the Money and Run (1969), and Bananas (1971). His Broadway play Don't Drink the Water was also made into a movie in 1969, although Allen neither directed it nor acted in it. His success continued with Play It Again, Sam (1972) (also based on a play he wrote), Sleeper (1973), and Love and Death (1975). Allen made his first serious film, Annie Hall, in 1977. It was a bittersweet (having both pleasure and pain) comedy about a romance that ends sadly. The movie won four Academy Awards (Oscars) including Best Screenplay (script) for Allen. He followed Annie Hall with Interiors (1978) and Manhattan (1979), both of which were more serious than comedic. His career as a serious film-maker had definitely been recognized. Annie Hall also marked the beginning of a nine-picture collaboration with movie cameraman Gordon Willis. Allen continued to use different filmmaking techniques to create a new style for each new film. He imitated the style of Italian director Federico Fellini (1920–1993) in his next film, Stardust Memories (1980). In that movie he plays a film-maker who does not like his fans. During an interview with Esquire magazine in 1987, Allen said, "The best film I ever did, really, was Stardust Memories. " Allen has been married to or has been romantically involved with the women who have starred in his movies. These include Louise Lasser (1939–), Diane Keaton (1946–), and Mia Farrow (1945–). Lasser acted in several of Allen's earlier films. Keaton appeared not only in Annie Hall, but also in Bananas; Play It Again, Sam; Sleeper; Love and Death; Interiors; Manhattan; and Radio Days (1987). Each relationship ended unhappily, but each actress received very favorable recognition for her roles in Allen's films. In 1982 Allen began working with his new off-screen partner, actress Mia Farrow, in a film that was loosely based on Shakespeare's (1564–1616) A Midsummer's Night Dream. Farrow also starred in Zelig (1983), Broadway Danny Rose (1984), and The Purple Rose of Cairo (1985). Hollywood gave three Oscars to the next movie they made, Hannah and Her Sisters (1986). They worked on several more films but ended their personal life together in 1992. Mystery (1993), which reunited (brought together again) him with Diane Keaton. It was pure comedy. Bullets Over Broadway (1994) was a critically-acclaimed (liked by reviewers) comedy and melodrama (a play or film relying on highly sensational events) set on Broadway in the 1920s. Woody Allen's most recent films are Small Time Crooks (2000), The Curse of the Jade Scorpion (2001), and Hollywood Ending (2002). Most of Allen's films have been made on modest budgets in New York City. Of the many film writers and directors, he is one of the few who has complete control of his films. Woody Allen has grown beyond his beginnings as a comedian. Today he is regarded as one of the most versatile (capable of doing many things) movie makers in America. Baxter, John. Woody Allen: A Biography. New York: Carroll & Graf, 2000. Lax, Eric. Woody Allen: A Biography. New York: Knopf, 1991. Meade, Marion. The Unruly Life of Woody Allen: A Biography. New York: Scribner, 2000.